Last Friday, President Donald Trump signed an executive order halting all refugee entry to the U.S. for 120 days, with admission of Syrian refugees suspended indefinitely and blocking entry for 90 days to residents from the mostly Muslim countries of Iraq, Syria, Iran, Sudan, Libya, Somalia and Yemen. Coming just a week after women’s marches in Washington, D.C., and around the U.S., Trump’s action fueled the determination of citizens already primed to act. 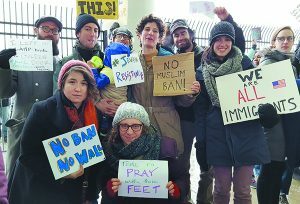 Although a U.S. district judge on Saturday granted an emergency stay to part of Trump’s executive order, protests already were set in motion for Sunday at major international airports in New York, Boston, Atlanta, Chicago, Los Angeles, San Francisco and more. Detroit was no exception. An estimated 2,500 people (organizers say 4,000) protested at Detroit Metro Airport Sunday afternoon at the McNamara terminal. Other protests occurred in Ann Arbor, Hamtramck, Dearborn, Traverse City and Grand Rapids. 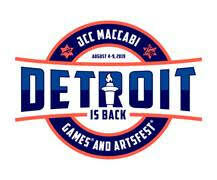 Jewish Detroiters were among the protesters locally. “I find it particularly ironic this troubling executive order was signed on Holocaust Remembrance Day,” said Batya Schreiber of Oak Park. “When I consider the lives lost because the Jewish refugees aboard the St. Louis were denied sanctuary in 1939 and were returned to Europe where many of the passengers perished, I don’t know how I could not try to do what I can to prevent similar tragedies in my own time. Suzanne Levin of Pleasant Ridge protested “because my grandmother Clara Birnbaum came here from Russia at age 7 in 1907 with vivid memories of pogroms. She was just one of 2 million Jews who came in the late 1800s and early 1900s. “Anne Frank was just one of 6 million Jews who died because no country would take them. That is why I protested,” Levin said. 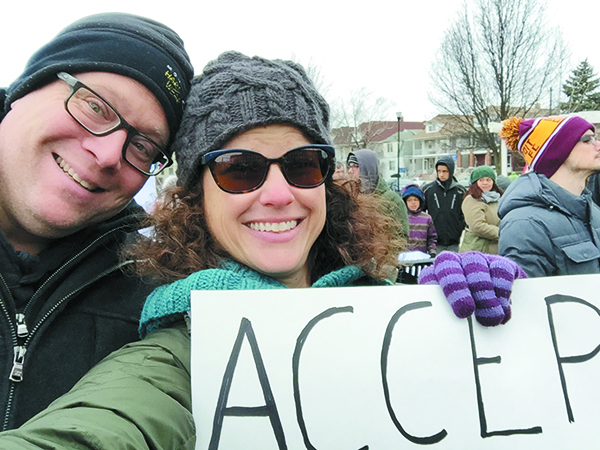 Leah and Randy Gawel of Novi were at the march in Hamtramck. 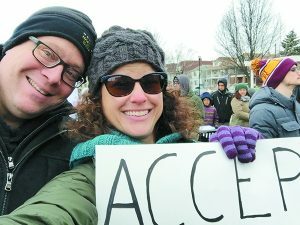 The week before, Leah and her teen daughter attended a women’s march in Ann Arbor. “For our family,” Leah said, “it was important to attend both rallies because we are Jewish; because my husband is one generation ‘off the boat’ from Poland; because any of my great-grandparents’ relatives who remained in Europe were murdered in the Holocaust; because we believe in the fundamental ideals that make America strong, diverse and free; and because we simply cannot sit and close our eyes in outrage and fear. “And, most importantly, because we are American. It is our responsibility to stand up for what is right. 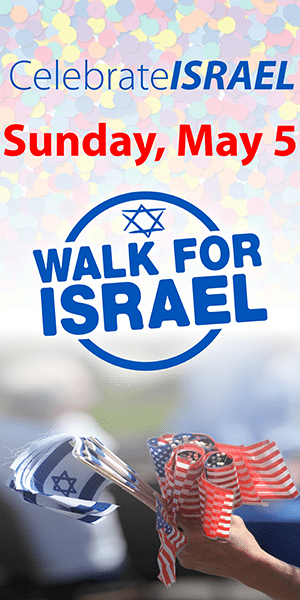 “We also spend time each day calling and emailing our elected officials, demanding change,” said Gawel, an educator at Congregation Shaarey Zedek in Southfield. Her husband is principal of Berkley High School. 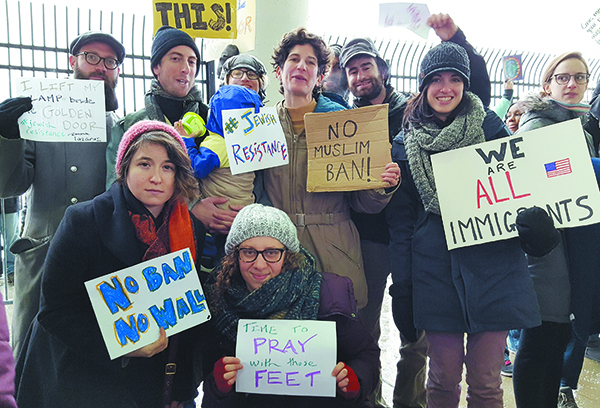 The airport protest was organized by Women March in Michigan and the Michigan Muslim Community Council, with JCRC/AJC and Detroit Jews for Justice (DJJ) among the partners. Nationally, all streams of Judaism issued statements condemning the executive action. “At the [airport] protest Sunday, I saw an older woman in a hijab holding a sign saying, ‘Anne Frank was a Refugee. #neveragain.’ I started tearing up looking at her,” said Alicia Chandler, a JCRC/AJC vice president. As an immigrant, Jane Gazman of Farmington, knows the importance of accepting the stranger. She and her family came here in 1990 as refugees from the Soviet Union. 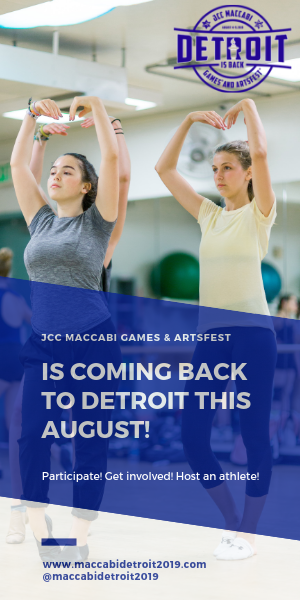 Through Jewish Detroit’s Family-to-Family program, they were “adopted” by Mandy Garver and Allen Wolf. Her first introduction to Judaism was at a Shabbat dinner at their house. The two families became one and, 27 years later, the friendship continues. “I have achieved academically and professionally,” Gazman, 36, said. “My brother in Chicago is a long-term volunteer with Big Brother Big Sister. My parents work for Ford Motor Company. My stepfather holds multiple patents. My grandfather Isaak Gazman has volunteered building computers for Jewish schools for nearly 25 years. The JN is part of the Detroit Journalism Cooperative. 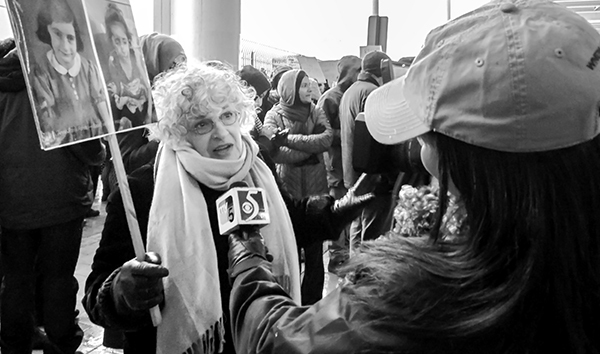 One of our partners, the Arab-American News shot a video during the airport protest on Sunday, Jan. 29. To view it, go to http://bit.ly/2jzGZC9. Trump isn’t closing the borders completely. Just to the terrorist countries until things straighten up. Stop comparing this to the Holocaust. It isn’t even close!